Garage door springs are an essential part of any garage door, automated or not. They’re like crucial little soldiers who tirelessly work to distribute the significant weight of your door to provide a balanced lifting action and smooth operation. Springs do this job constantly, even when the door is not in operation, the result of which is that they are certain not to last forever. When the time comes to replace them, it can be tempting to take the DIY route, but springs are dangerous to work with, so much so that it is best left to a professional when replacements are in order. Here are the reasons why. Detaching a spring means you will be releasing a fair amount of tension, enough tension in fact, to hold up a garage door. Working safely with springs requires specific tools and skills, and those skills cannot really be developed by watching a video on YouTube. If you really know what you’re doing, then perhaps you stand a chance, but if you are a layperson, fixing a broken spring is really not as easy as it looks. 2. Do you like your fingers? DIY spring replacement requires you to put your fragile digits into some harrowing spaces, and with one false move or an unexpected release of tension you could genuinely maim yourself. Is saving a bit of money on doing it yourself really worth your much loved fingers? I should hope not. Another good reason to avoid going the DIY route is that doing the job incorrectly can have some severe ramifications for your whole system. 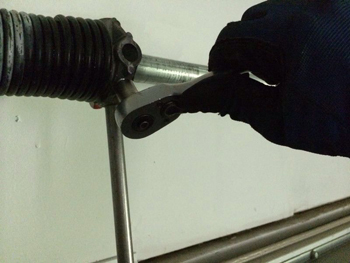 Misaligned garage door springs will cause tension on the brackets and bearings where it shouldn’t. So not only will it be more difficult to open and close the garage, but it will cause some pretty severe damage over time, which could lead to expensive maintenance repairs. You might feel like you’re saving money by doing it yourself, but if you get it wrong it will cost you double. While we understand the appeal in pet projects and the pride that comes with fixing things yourself, we would like to point out that when you weigh up the possible consequences of getting it wrong, well… it’s really not worth it at all.